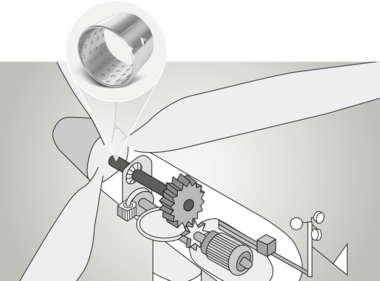 Most wind turbine systems have a horizontally-mounted 3-blade rotor. The wind causes the rotor blades to rotate. The mechanical rotary motion is transferred from the rotor hub to the rotor shaft and is converted by the gearbox for generator operation. In order to take full advantage of the wind, the nacelle and rotor blades are continually adjusted. The rotor blades are mounted in the hub so that they are rotatable and are adjusted hydraulically using a push rod. The push rod must not be bent and must be guided using damping because of permanent vibrations. The linear spigot bearing of the push rod is realised using two low-maintenance KS PERMAGLIDE P20 plain bearings. The plain bearings are initially lubricated with grease, which ensures low adjusting forces and smooth guiding. Thanks to the high wear resistance of the KS PERMAGLIDE® P20 material, the bearing clearance hardly changes, meaning precise adjustment is constantly guaranteed. The standard P20 version features oil distributing pockets as per DIN ISO 3547. The bearings are provided ready to install for recommended connection-design installation dimensions. Also available are versions with a different wall thickness, suitable for rework when installed, or with a smooth sliding surface for hydrodynamic applications.